1. When not in use the instrument should be kept in its closed and latched case—and this means during rehearsal breaks too! Don’t bother to lock it because case locks wear out quickly and usually fail in the locked position. Vacuum out the case frequently to get rid of rosin dust and bugs. If the case cover has a zipper, remember to unzip it all the way—otherwise the zipper will fail prematurely. 2. Extremes of temperature or humidity are not good for instruments. Rapid changes in humidity can cause open seams, cracks in the finish, and cracks in the wood itself. During dry humidity periods a tubular instrument humidifier should be used. Please refer to instructions for its use below. There are also a number of reliable case humidifiers available as well. Excessive humidity is also a problem, but it is more difficult to control—keep your instrument out of the basement in the summer. 3. Never leave your instrument in a hot car or you will get a big surprise! The temperature inside a car directly in sunlight can exceed 150° F. This is also why you should never store any musical instrument in the attic. The varnish can be damaged and instruments assembled with improper glue can literally melt apart. Conversely, a cold violin can be problematic as well. If your instrument gets below 40° F, allow it to warm up gradually in its case before you remove it. If an instrument warms up too fast the result can be similar to the above humidity problems. 4. Always wipe the rosin off of your instrument after you have finished playing. Accumulated rosin can damage the finish. Use a soft 100% cotton cloth like an old non-terry dishtowel or part of an old t-shirt. If rosin cannot be removed, take your instrument to a qualified repair person where the rosin will be chemically removed. I no longer will sell or give formulas for violin cleaner because cleaners that actually work can often cause problems in inexperienced hands. If your instrument looks dull or covered with fingerprints you may use a commercial violin polish; however, be aware that these products contain wax and many of them do not dry thoroughly. Always apply sparingly and remove as much polish as possible with a soft cotton cloth. If the finish prints easily, then there is still too much polish on the surface. 5. Hold your instrument by the neck only. If you have a fine instrument the acids and oils in your perspiration can quickly wear away the varnish (that’s why the neck is unvarnished). Touch the top as little as possible. If you use a shoulder rest (most players use one today) be sure to attach it and remove it safely, placing the body of the violin against your torso and holding the neck in your left hand. Attach the rest with your right hand. That way no one can knock the violin out of your hand in the typical frenzy of a rehearsal. If the shoulder rest has latex covered feet, replace the latex tubing when it becomes cracked and dry before it causes any damage to your instrument. Amber latex hose is most easily installed on your shoulder rest feet with denatured alcohol. 6. Be sure to keep your bridge straight. The best bridge will warp if it is not maintained. Your teacher or repair person will show you how to do this. 7. If your pegs stick during high humidity and you cannot move them do not force them or attack them with pliers! You could crack the peg or even break off the peg box. Take the instrument to your repair person, as he or she knows how to loosen them safely. Use lava soap or commercial peg dope to lubricate sticky pegs. 8. Always loosen your bow hair when you are finished playing. Be aware that humidity has an effect on the length of the hair. Sometimes during the dry season you will not be able to loosen the hair all the way. If it is a little too tight do not worry, but if the hair is tight enough to play, take it to a repair person and have the bow rehaired (or the hair stretched). When not actually playing, always hold your bow at the frog with the tip pointing up; do not use it as a pointer, a cane, or a sword; and certainly do not bang it on a music stand to applaud a soloist! When you attach your shoulder rest, do it without your bow in your hand. Also, do not over rosin. If you had enough rosin on your bow yesterday when you finished practicing, there is no reason to add any today. Have your bow rehaired at least once a year. 9. If you have a problem with your instrument, take it to a competent repair person. Be advised that the vast majority of music stores do not have a qualified repair person even though they advertise repairs. Before you entrust your instrument to anyone, be sure to inquire about his or her qualifications. Be sure to examine your instrument frequently for any problems—warped bridge, open seams, cracks, etc. Small problems do not become big ones unless they are neglected. 1. 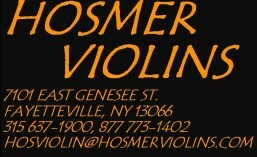 The indoor relative humidity in Central New York often falls far below safe levels for string instruments during the winter months (Nov. to April) The use of a tubular humidifier greatly reduces the detrimental effects of dryness (open seams, cracks, low string height, etc.). If you live in a more temperate area–like Virginia–you probably won’t need to humidify your instrument. Your problem, at least in the summer, will be too much humidity. 2. Start with cold water. Place the humidifier in the stream and squeeze water through the holes into the sponge inside. Remove it from the stream and slightly squeeze out the excess water. Dry off the outside. Water should not drip from the humidifier—it should feel like a piece of limp spaghetti. Over-filled Humitrons and Dampits can cause major water damage inside your instrument, especially in cellos. Provided instructions seldom warn against this problem. 3. Place the humidifier in the lower left f-hole. Be careful of the point on the f-hole when removing the humidifier. The instrument must be in its case for the humidifier to function. 4. The humidifier should be filled every day, since you are not putting that much water in it in the first place. 5. If tap water has a high mineral content you will need to replace the humidifier once a year. Use of distilled water will greatly increase its life. A new humidifier every year is cheap insurance against against the annoying problems of a dried-out instrument. 1. When you are not playing your instrument, keep it in its closed and latched case. 2. In the winter, use a humidifier. 6. Don’t drop it; hold it by the neck only. 7. Use the shoulder rest properly. 8. Keep the bridge straight. 10. Take care of the bow. Loosen the hair when you are not playing and have it rehaired once a year. 11. Only allow qualified technicians work on your instrument.